Here’s heartwarming proof that some people will stop at nothing to offer help in a dire situation. Puerto Rico was struck by disaster yet again Wednesday afternoon when an issue with a transmission tower caused the entire island to lose power. 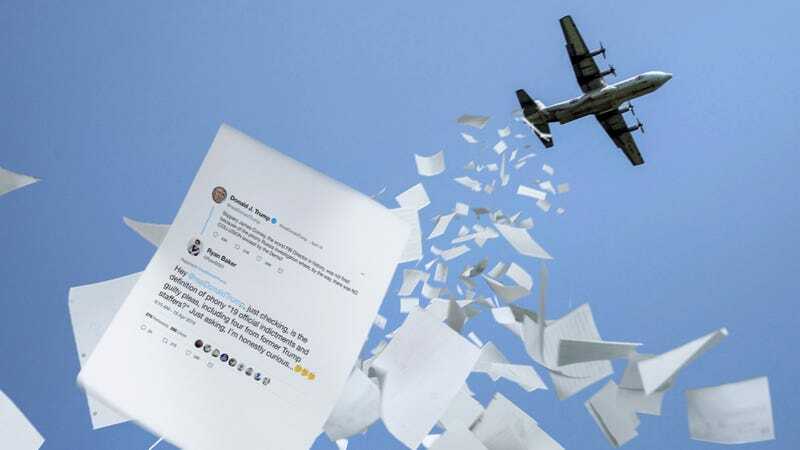 But in the face of this adversity, an incredible disaster relief organization called Aid The Way stepped in and made all the difference: In the midst of the blackout, this amazing charity air-dropped printouts of the most epic Trump takedowns on Twitter to the citizens of Puerto Rico so they wouldn’t miss anything. Wow. This is an incredible gesture that will seriously help the people of Puerto Rico in their time of need. Just hours after the news broke that Puerto Rico was without power, the heroes at Aid The Way mobilized thousands of volunteers to collect the most recent @realDonaldTrump slams that the unfortunate citizens of Puerto Rico would be in dire need of as their lack of electricity drags on. Never once forgetting their mission to make sure that Puerto Ricans are up to date on the latest tweets deriding Trump’s small hands or GIF of his hair flapping in the wind, volunteers worked through the night to get planes in the air to make sure the island was aware the #Resistance is still sticking it to POTUS good on the internet. So inspiring! According to Aid The Way, a plane full of sick internet burns is already on its way to the island that will have beleaguered Puerto Ricans saying things like “got him!” and “totally owned” in no time. Thanks to dedicated relief organizations like this one, it seems like Puerto Rico will be on its way to recovery in no time. Incredible work, Aid The Way!